Tens of thousands of students across the country — many chanting “Enough is Enough” — walked out of their schools Wednesday to protest Congressional failure to directly address gun violence. The protests began at 10 in the morning local time at about 3,000 schools. Most lasted for 17 minutes — one minute for each massacre victim at Marjory Stoneman Douglas High School in Parkland, Florida — one month ago Wednesday. Some students held up signs reading “Our Blood, Your Hands,” condemning the National Rifle Association. Other students wondered aloud if they would be the next victims of a mass school shooting and told reporters they were simply sick of it. There were also protests outside the U.S. Capitol — where demonstrators were welcomed by Democratic House Minority Leader Nancy Pelosi — and at the White House, where students turned their backs to the executive mansion in silence. President Donald Trump was not inside. Many teachers, parents and school administrators took part in the global walkout. But some school officials warned students they would be suspended for leaving their classrooms without authorization. Alleged Florida gunman Nikolas Cruz was arraigned during a brief court hearing Wednesday. Cruz looked down and did not speak during the hearing. The judge entered a not guilty plea on his behalf. Cruz is charged with 17 counts of premeditated murder. His attorney said Cruz would plead guilty if prosecutors sought 17 consecutive life sentences instead of the death penalty. Also on Wednesday, acting FBI Deputy Director David Bowdich told lawmakers in Washington that agents got what he called a “very explicit” tip five weeks before the attack that Cruz may have been planning the high school massacre. For reasons unknown, the FBI did not pass the information on to local police. Authorities previously said they had other warning signs about Cruz but did not act on them. Cruz was a well-known troublemaker at Stoneman Douglas high school, disrupting classes and threatening other students, before he was expelled. ​Meanwhile on Wednesday, the House of Representatives overwhelmingly passed a bill increasing funding for school safety. The bill includes more money for training school officials and police to recognize mental health problems in students, an anonymous tip line for reporting school threats, and money for security measures such as metal detectors. The Senate has yet to take up the measure which Trump said he would sign. The House bill does not address the issue that led students to walk out of their classrooms — tighter gun laws, including a federal ban on assault-style weapons, like the one Cruz allegedly used. President Trump initially came out in favor of raising the minimum age for buying a gun from 18 to 21, but has since backed away. The NRA opposes the measure and plans to sue Florida for passing an age limit. Trump has also said he supports arming specially qualified and trained teachers and school personnel as a deterrent to a potential school shooter. But many teachers’ groups and police oppose the idea. 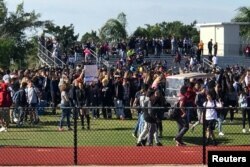 Students walkout at Marjory Stoneman Douglas High School during National School Walkout to protest gun violence in Parkland, Florida, March 14, 2018. Wednesday’s walkouts are among several protests in the coming weeks. The March for Our Lives rally for school safety is expected to draw hundreds of thousands to Washington on March 24. Another round of walkouts is planned for April 20, the 19th anniversary of the Columbine High School shooting in Colorado.